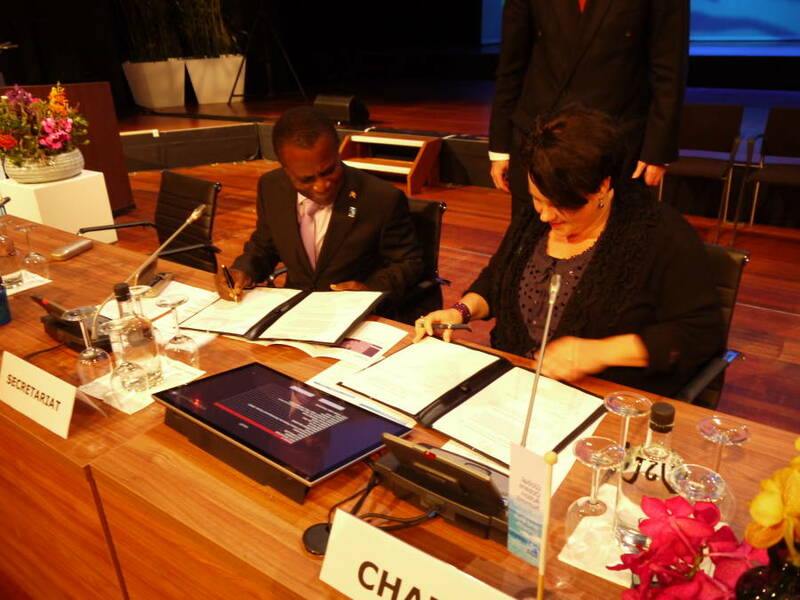 Today in The Hague, Prime Minister, Dr Keith Mitchell signed two Memoranda of Understanding (MOUs) on sustainable development with the Dutch Government. The MOUs encompass the “Blue Economy” and “Climate-Smart Agriculture” as two integrated programmes to improve sustainable productivity at land, and at sea, so as to benefit farmers, fishermen, agri-businesses and tourism businesses. The Prime Minister delivered the Keynote Address at the Global Ocean Action Summit. The Global Ocean Action Summit for Food Security and Blue Growth attracted over 700 international delegates, and is promoting action on Governance, Investment and Partnerships. Mitchell welcomed the leadership of Minister Sharon Dijksma and Vice Minister Hans Hoogeveen from the Dutch Ministry of Economic Affairs, for bringing greater global attention to sustainable development and food security through initiatives related to climate-smart agriculture and blue growth. The Netherlands have partnered with Grenada, Indonesia, Norway, and the United States. The Prime Minister emphasised the need for growth as Grenada implements its Home Grown fiscal adjustment programme with the support of churches, unions, political parties and other stakeholders, and “tangible deliverables” directly to farmers, fishermen, agri-businesses and tourism operators. Under the MOU arrangements the Netherlands is providing EC$5 million to Grenada. The Netherlands will also work with Grenada to attract a further EC$ 5 million from the Dutch private sector banks and businesses. The Dutch Government covered all travel and accommodation costs related to Grenada’s partnering role. In support of the growth agenda, the cooperation agreement with the Netherlands envisages the establishment of an International Spice Institute, to be co-located in Grenada and the Netherlands, and the establishment in Grenada of a Blue Economy and Oceans Governance Institute. These will enable Grenada to institutionalise knowledge and human capacity and also to “crowd-in” other partners and funders. The institutes will help Grenada to grow its economy through more value-added agri-business products, and through the development of an ocean-based economy that builds on fisheries and tourism. Ultimately this could include, for example, aquaculture, algae-based cosmetics and pharmaceuticals, ocean energy and other sectors. Mitchell invited the Dutch Government to send to Grenada, a delegation that will include private sector companies. The details of the agreement are to be finalised among the Dutch Ministry of Economic Affairs and Grenada’s Ministry of Foreign Affairs and International Business, and its Ministry of Agriculture and Fisheries – which will be the main conduit for the public investment aspects of the programme. Grenada, the Spice Isle, is the world’s second largest producer of nutmeg after Indonesia, a former Dutch colony. However, with a land area of 348 square kilometers and an exclusive sea area of over 26,000 square kilometers, Grenada has considerably more resources at sea than on land, lending further weight for focus on the ocean-based economy. With the support of The Nature Conservancy (TNC), Grenada already hosts the Secretariat of the Caribbean Challenge Initiative (CCI) which seeks to help the Caribbean conserve its marine environment while promoting sustainable fisheries and sustainable tourism. Prime Minister Mitchell co-hosted a regional meeting of the CCI with Sir Richard Branson in 2013. Grenada is a charter member of the Global Partnership for Oceans, facilitated by the World Bank. At the Global Ocean Action Summit, Mitchell called upon the international community to utilise Information and Communications Technology (ICT) to better coordinate international investments in oceans and “blue” growth. Grenada is positioning itself as a knowledge hub for industries such as medical services and ICT. Prime Minister Mitchell is taking the lead on ICT amongst Caribbean Heads of State.